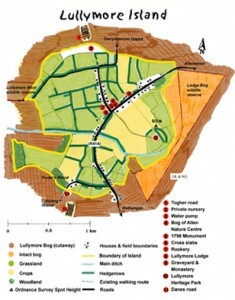 A new loop walk on Lullymore Island, Co. Kildare is going to be presented during an Open Day of the Bog of Allen Nature Centre on Sunday 21st July 2013. Lullymore is a rock in the middle of the Bog of Allen and has a wonderful variety of habitats and local history just 3km in diameter. It was never swallowed up by the bog and it exists today as an “island” in the bog. The new looped walk connects the features of the island. “The development of the loop walk involved field surveys of the features of the island, talking to residents about local history and looking for the most beautiful and peaceful spots on the island that might appeal to visitors” says Leonie Tijsma, who studies Forestry and Nature Conservation at the Larenstein University in the Netherlands. “Developing a walk is a nice way to get to know local people and the area. I hope walkers will enjoy the Lullymore Island looped walk as much as I have enjoyed developing it,” she added. 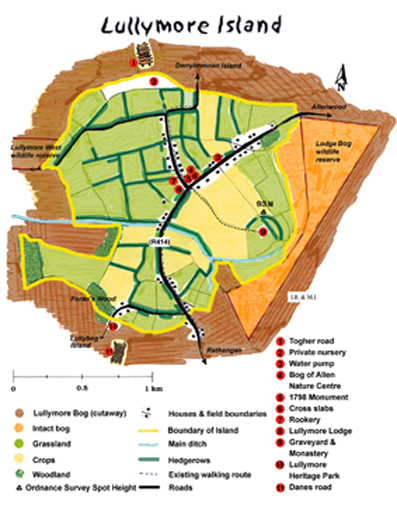 Admission is free to the Open Day, which takes place from 2 to 5 pm at the Bog of Allen Nature Centre in Lullymore, Rathangan, Co. Kildare. The Open Day includes a presentation and a loop walk. A special guest of the day will be the Dutch Ambassador to Ireland, His Excellency Mr. Paul Schellekens. Photographs and interviews available on request, telephone on 045-860133 and ask for Leonie Tijsma, Dutch Research Student, IPCC, Bog of Allen Nature Centre, Lullymore, Rathangan, Co. Kildare, or email bogs@ipcc.ie. This entry was posted in News and tagged Activities, Attraction, Bogs, Conservation, Family Nature Activities, Festival of Nature, Ireland, open day, Places to Go, Things to Do, visitor, Visitors. Bookmark the permalink.